Inspiration for his future property struck when Peter Bahouth was only eight. 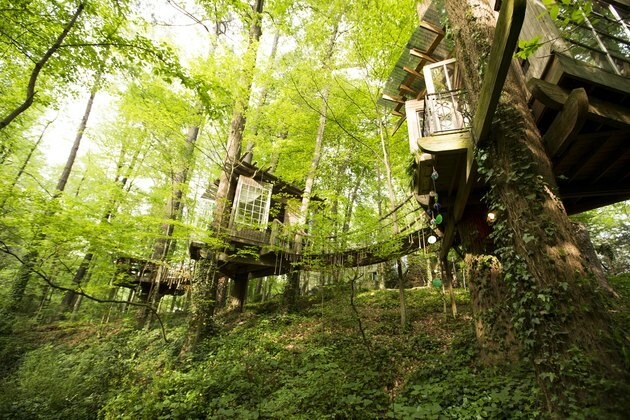 Long before he had a distinguished environmental career, he spent time in a secluded treehouse. "I remember thinking [that] if I had a good allowance I'd really trick this place out," he said. 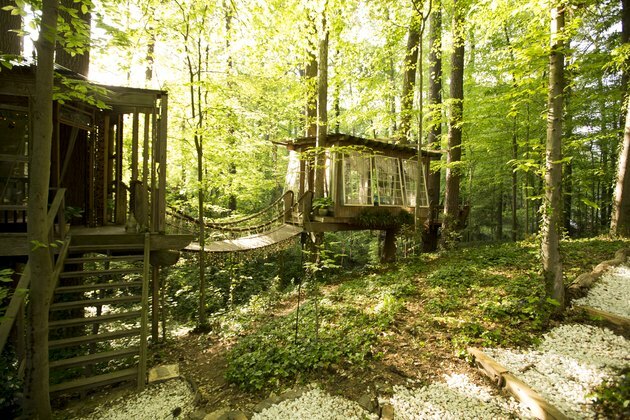 He forgot about this thought for decades — until he bought the wooded acre lot adjacent to his home in Atlanta. 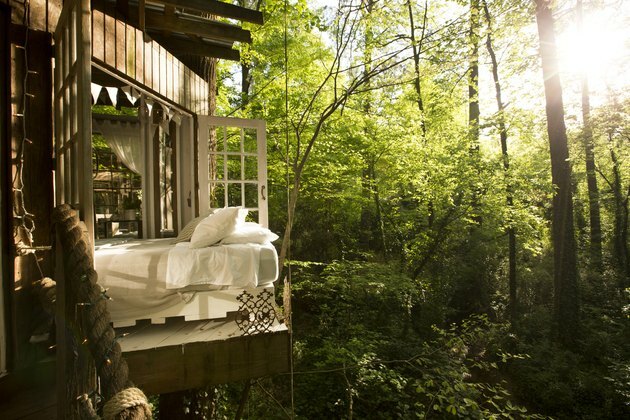 Bahouth set about planning an adult-friendly treehouse with the help of a crew over the course of six months. Then, they took another six weeks to bring his long-awaited dream to life. Three distinct spaces are suspended over seven outstretched trunks, and rope bridges dripping in Christmas lights connect them all in an illuminated maze. 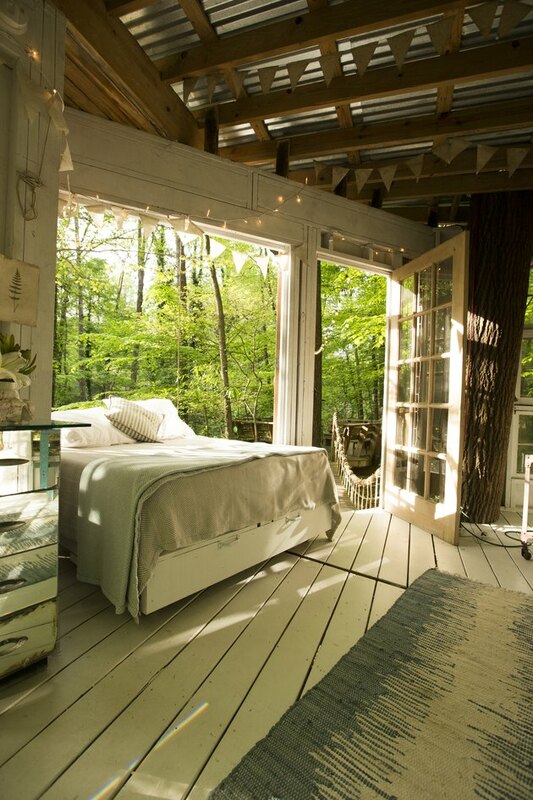 The finished structure boasts a bed that can be wheeled onto a balcony, vintage pieces that fill the spaces with rustic charm, and butterfly windows that open to a sea of leaves. And when it rains, the treehouse's corrugated tin roof helps create a natural symphony. It's plenty of privacy for a setting that was always intended to feel far removed from the rest of the world. 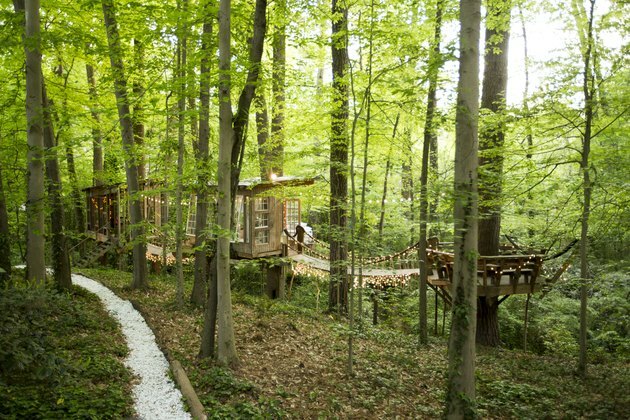 The treehouse's three rooms are inspired by "mind," "body," and "spirit." The sitting room provides a gathering place for conversation, and the calming bedroom is intended to restore the body. The final "room" is for contemplation — it's a roofless area with built-in benches that surrounds a 165-year-old pine. The rooms were constructed so that the trees holding it up can move. Beams were inserted into brackets on the tree trunks, rather than directly into the trunks themselves. The interiors of the house, including the sitting room, are mostly designed with repurposed material and filled with unique pieces from Bahouth's life — including a wooden bird from friend Jane Fonda. Bridges feature 1,700 feet of rope that was made with hemp instead of nylon. This bridge leads to the private bedroom. 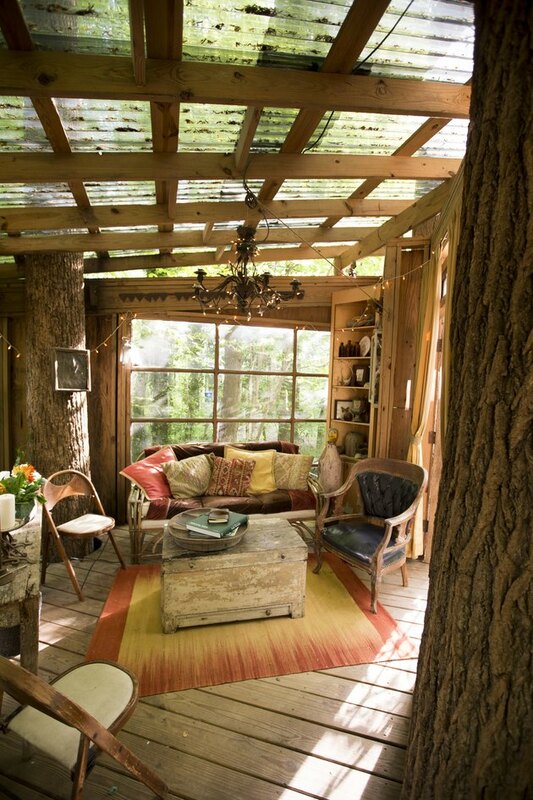 While rustic touches are obvious for a treehouse, Bahouth used luxe details to make the spaces feel more comfortable. For instance, he outfitted a Loblolly mattress with Parachute sheets in the bedroom, which is in the middle structure. Bahouth's childhood fantasy of having a bed that could be pulled out "like a drawer" is now a reality, since the bedroom can be rolled out into the fresh air. The roofless room surrounds a tree that Bahouth dubbed the "Old Man." 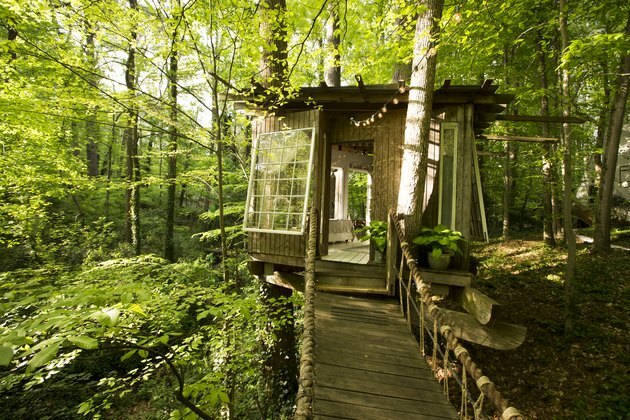 The treehouse is meant to reconnect guests with nature and help them unplug — even though the property is still close to the city.